Deaf dog: Cloie Is now 1 year old. We adopted her July 12, 2001, From the Defiance County Animal Shelter. She enjoys running all round the house until she completly wears out her best frind A 2 year old Lab. She has a small list of signs we use for her including Sit, Down, No, Come, Stay (only works when she is sleeping). Both of our girls will do anything for Moms home treats. Her Favorite things to do Go in car rides, The Drive in theater Loves that big Screen, Going to Mc Donalds for a burger, and most of all pushing her family out of bed by taking half of the Queen size bed. 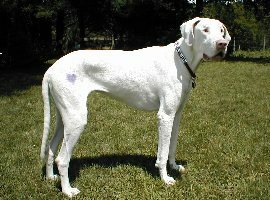 Deaf dog: Trouble is 16 month old Great Dane, he is big and tall, white with blue eyes. His registered name is "Donna's White Tornado", and he lives up to both of his names. We are currently trying to intoduce a new hand signal every month. For being deaf he listens better than the two that can hear! 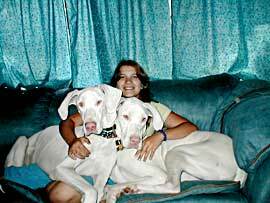 We got him from a breeder in Ohio, we asked her for a white Great Dane, so we kner the pup would eithe have a hearing problem or blind. Most people how meet him are surprised to know that he is deaf. Our goal is to go back to school and eventually become a therapy dog. He is a very loving and affectionate dog. Trouble loves to eat, especially fruits & vegetables, like cherries & grapes. His favorite things to do are watch Animial Planet, play with his ball, and chase Holly & Rosie around the yard. Trouble is the best kind of trouble a person could have, and I wouldn't trade him for all the hearing dogs in the world. Cameo is a 4 year old Great Dane. Her family says "We adopted Cameo from Harlequin Haven Great Dane & Saint Bernard Rescue after she was turned over by her breeder with her brother (also deaf). She had planed on euthanizing them had rescue not taken them in." Dejavu is a 3-1/2 year old Great Dane. "Though she had promised not to breed again, six months later their breeder had another litter with another deaf puppy and turned her over to rescue as well. We promptly adopted her and named her Dejavu. They are both wonderful. We've been in several parades with them and they're always a big hit as they love the attention. They also have limited vision so we do a lot of touch signals with them and it works very well. Having these girls has really brightened our lives they have brought us so much love." Other pets: 2 hearing Danes, an Italian Greyhound, 3 Cocker Spaniels, a Doberman, and 14 cats. Both our girls though being deaf and mostly blind play ever so gently with the small babies. 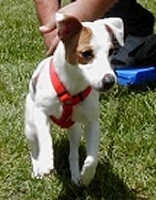 Deaf dog: Sadie is a 2-year old Miniature Pinchure who is learning gestures and home sign language. Her Mom says: "I didn't know she was deaf when I got her. Her breed is stubborn and I thought that was all it was. Then when I would get home and call for her, she would sleep right through it. She didn't know her name, etc. I love her just the same. She knows I love her. I just wish she could hear me tell her!" 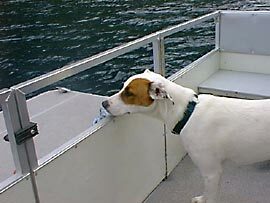 Deaf dog: Bella is a 1-1/2 year old Harrier Mix. "We got Bella from an Animal Shelter while living in California. We did not realize she was deaf until a week or so after we got her. We have taught her hand signals. She's a quick learner. We didn't think having a deaf dog would be smart since we have a little boy, but she's very gentle and loving with him. She's always been special to us, but she's more special because she depends on us so much. We love her to death!" 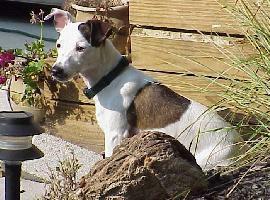 Deaf dog: Sassy's human pal writes: "Sassy is energetic, and ornery. We love her a lot. We bought her NOT knowing she was deaf. My husband has always wanted a JRT and Sassy just had a "way" about her that made him fall in love with her at first sight. When Sassy did not respond to training techniques...we had her tested; finding she was deaf in both ears. She has everyone in the house wrapped around her little toes. Her best friend is our 6 year old boxer, Jake. We will be starting school with Sassy soon. We want her to have a good home and be able to communicate with her. She stole our hearts and though we are overwhelmed at the responsiblity with a deaf dog...we are looking for ways to train and communicate with her." 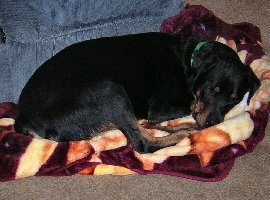 Deaf dog: Oberon is a 1-1/2 year old Rottweiler. "Oberon came to us through the good people at the TAHS (Toledo Area Humane Society). He looks normal and behaves like a normal rottie pup. He is gentle and loving and NOTHING at all like the horror tales you hear about Rottweillers." Other pets: Loki a 3yr old Rottie; and cats, Tiamat, 13year old Ragdoll cat, Lola 8 year old Egyptian Mao; Merlin, 3 year old white Calico, and Arthur 7 month old Orange tiger stripe. 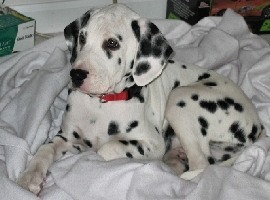 Deaf dog: Teardrop, 12 weeks on 3/8/04, is a Dalmatian. "Just rescued this little pooch from the humane society! He was named Teardrop there because of two spots he has, under his eyes, that look like tears. I hope to find a happier name for him soon! He lives here with his "big" but soon to be little sister, Amy, a hearing Dal/Lab mix. So glad to have him here, as he is a doll! His previous owners knew he was deaf, but chose to give him up as they didn't have time to work with him. He thinks he's a lap dog, but I tried to tell him that won't last too much longer! He's already growing like a weed!" Other pets: Amy, 10 months on 3/15/04, hearing Dal mix. Deaf dog: Riley Scott is a 4 year old Cocker Spaniel. Riley had to have his ear canals taken out because of chronic ear infections.